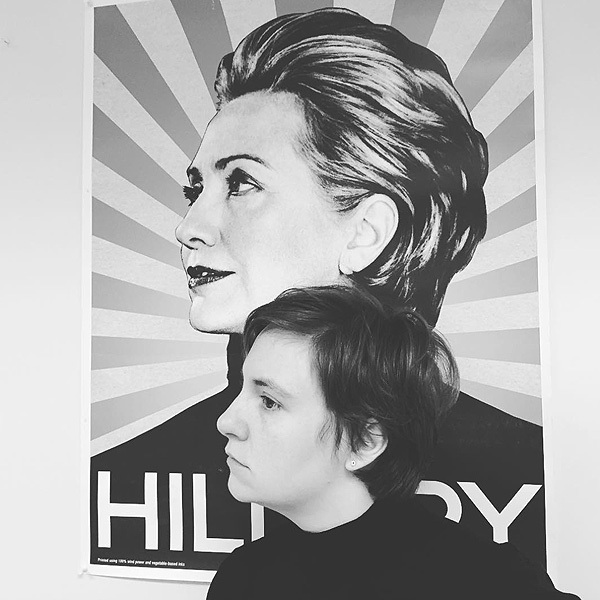 I saw this picture of Lena Dunham in front of a Hillary Clinton poster, and I spent a few minutes looking at the poster and thinking about it. Interesting, isn’t it, how political posters get designed? Obviously, the poster artists are searching for a perspective and message that will appeal to the voting masses. And, these days, everyone would like to develop one as fabulously successful as the Obama “Hope” poster. With its basic primary colors and design, the placid, thoughtful expression on the candidate’s face, and the simple message that clearly connected with a broad swath of the electorate, you saw the “Hope” poster everywhere in 2008. The Hillary poster behind Lena Dunham obviously has a different focus and purpose. Rather than matching the candidate with a message, it’s about the candidate and only the candidate — with Mrs. Clinton’s head framed against the rays of the sun, and her first name, and only her first name, below. And the picture of Mrs. Clinton certainly seems designed to portray an image of youthfulness and vigor, doesn’t it? With the thrust-out chin, the lacquered, swept-back hair, the unlined face and distinctive makeup, and the black turtleneck, the poster depicts Hillary Clinton as a stylish thirty-something hipster who just walked out of a Soho coffee house after a poetry reading — rather than a woman approaching 70 who seems to prefer pants suits. Many political posters remind me of old Soviet Union propaganda pieces, and this one does as well. The old USSR posters always seemed to depict the Soviet people as lantern-jawed, dramatically backlit, muscular titans striding into the future and sternly doing battle with the evil forces of tubby, cigar-smoking capitalist fat cats. The sunburst design and pose in the Hillary poster are echoes of those relics of a failed regime. Ultimately, political posters want to present the candidate in idealized form, in an effort to steer voter perception. The Obama campaign wanted Barack Obama to be seen as an agent of Hope and Change during hard times. What, exactly, does the Hillary Clinton poster want to tell us about Hillary Clinton, the candidate?